NPR News Nuggets: A Clown And A Bicycle Race, With A Side Of Spilt Nachos Here's a quick roundup of some of the mini-moments you may have missed on this week's Morning Edition. Boston is not clowning around. 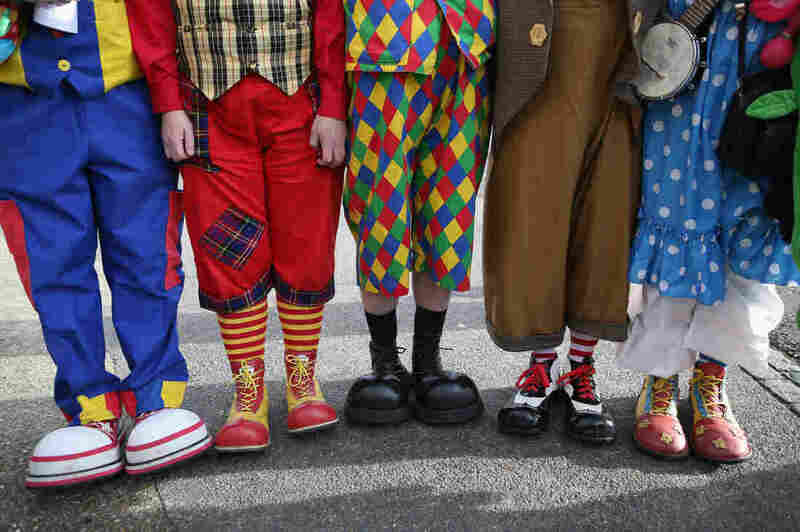 When a city council candidate showed up at polling station dressed like a clown, concerned parents called the police. Pat Payaso thought it would be a fun way to engage voters (because his last name means clown in Spanish) but it didn't go over as planned. What do you call cheese that's not yours? Nacho cheese! Dad jokes aside, Addison Russell of the Chicago Cubs proved as much after Monday's game against the St. Louis Cardinals. As Morning Edition host Mary Louise Kelly said on Tuesday, Russell dived into the stands at Busch Stadium while he was trying to catch a foul ball. In his attempt, he crashed into a Cardinals fan and sent the man's nachos flying. Cheese, jalapenos and chips went everywhere. If you're not familiar with baseball, the rivalry between the Cubs and the Cards is pretty intense, but the Russell may have softened this particular fan's views when, a little later in the game, the Cubs player came back with a fresh plate of nachos. The fan accepted the cheesy goodness and marked the momentous occasion with a selfie. It's fall — a time to admire the leaves or watch as many scary movies as you can. If you are in the latter category, you probably know that clowns aren't just silly circus people, but actually terrifying creatures. Remember the sinister-looking clowns that appeared in woods and around towns last year? Terrifying. With that in mind, you would think people would realize that clowns aren't the best way to greet people. But that wasn't the case for Pat Payaso of Boston. As Morning Edition host Rachel Martin said on Thursday, Payaso is running for city council in Boston. Since his last name means "clown" in Spanish, he thought it would be fun to dress up as one, greet people at polling stations and maybe garner a few more votes. Unsurprisingly, it didn't go as planned. As the Boston Herald reported, worried parents called the cops when they saw Payaso "decked out in traditional clown face paint, a bright red wig, green checkered suspenders and a requisite ruby-red clown nose." While Payaso isn't Pennywise, hopefully he learned clowns aren't the way to secure votes. Planning trips is fun as long as you know where you're going. But maybe the opposite is true, too. John Hoopingarner of Ohio thought he knew where he was going when he planned a trip to and from Birmingham, Ala., for a bicycle race. But, as Morning Edition host David Greene said on Tuesday, Hoopingarner didn't read the fine print — because the race was actually in Birmingham, England. As the BBC reported, upon realizing his mistake, Hoopingarner decided he still wanted to participate in the race, and made the transatlantic trip. He was a good sport and said, "Birmingham was the coolest place I've been to in the UK yet — it was really fabulous. The people are great, the town's awesome, the guys that did the ride were really tremendous. It was a brilliant event." As for next year, Hoopingarner says he hopes to be back — and chances are he will, as the organizers of the event offered to cover his entry fee.